The Southwest Utah Public Health Department, approximately 120 miles from Las Vegas, serves one of the fastest growing areas in Utah. Its borders include 40 incorporated cities and towns, one federally recognized tribe, ten state parks, one national forest, and two national parks. Paulette Valentine is the Director of the Emergency Preparedness and Response Division of the Southwest Utah Public Health Department which oversees the safety of 215,000 residents plus 3.5 million visitors a year in a 17,000 square mile rural region covering five counties. Since disasters do not recognize boundary lines, incorporating the federal, tribal, public, private and non-profit sectors in planning and response efforts is essential in keeping people safe. After the 9/11 terrorist attacks and the anthrax attacks of 2001, the federal government recognized the unique role of public health professionals in preparing for, responding to, and recovering from disasters. In 2002, the Public Health Emergency Preparedness (PHEP) program at the Centers for Disease Control and Prevention (CDC) was created. In the same year, the National Bioterrorism Hospital Preparedness Program—later Hospital Preparedness Program or HPP—was established to enhance hospitals’ ability to respond to a biological attack. Public health professionals know natural and human-made disasters can strike anywhere, anytime. In just one week in April 2013, terrorists attacked the Boston Marathon and a fertilizer plant exploded in West, Texas. When a health emergency strikes, local health departments like the Southwest Utah Public Health Department have a big job to do to keep people in their communities healthy and safe. The staff of the Southwest Utah Public Health Department, like their counterparts nationally, investigate disease outbreaks and contain their spread by advising local leaders when to close schools and other public places. They develop plans and hold preparedness drills to mitigate a wide variety of public health threats from a nuclear or radiological accident, to food contamination, to active shooter incidents or severe weather events. In order to help people prepare for emergencies, they educate the public about creating home and workplace emergency kits and how to protect themselves in an emergency; such as by wearing masks, drinking bottled water, or staying indoors. Funding for PHEP at its highest point in 2003 was nearly $1 billion. But just a decade later, austerity has taken its toll on the preparedness infrastructure. In 2014, funding was cut to $640 million, and President Obama proposed a further decrease in 2015. HPP, administered by the Department of Health and Human Services Assistant Secretary for Preparedness and Response, was cut by one-third ($104 million) to $255 million in 2014. The Southwest Utah Public Health Department receives little local or state support for its emergency preparedness activities. In 2010, during the H1N1 flu pandemic, the agency had seven staff working on emergency preparedness and received $674,000 from the federal government. Today, they have only three fulltime employees and a budget of less than $430,000 dedicated to preparedness. After 9/11, PHEP helped us to get all of public health up to speed and build the necessary infrastructure. However, as the workforce is cut, requirements and regulations don’t go away. Cuts to HPP may require reducing the health department’s hospital preparedness coordinator to part-time. If that happens, “Years of planning will be lost. 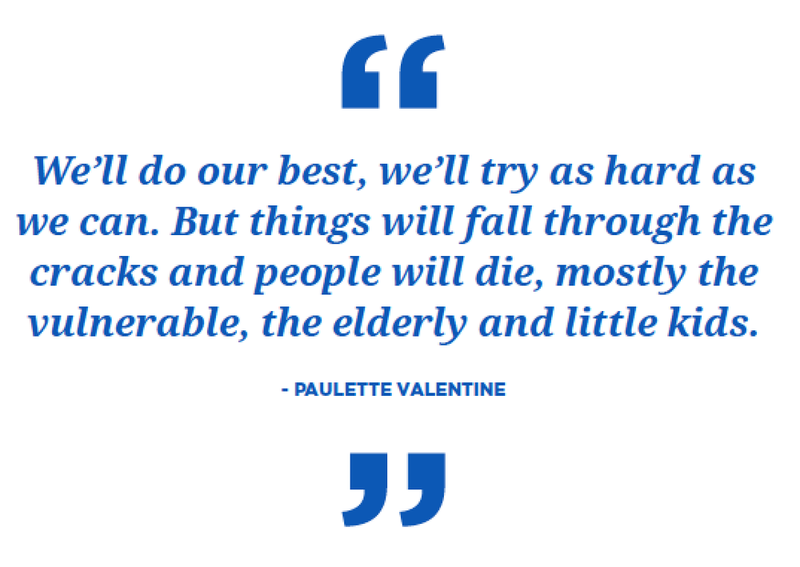 We are just getting to the point of having good medical surge plans,” said Paulette. “Without someone to coordinate with the hospitals, that capacity will be lost in an emergency.” The human consequences resulting from the lack of coordination could be dire. With such limited resources, Paulette is distressed that she and her staff can’t be in all the partner meetings where they should be. Many federal grants from the Federal Emergency Management Administration require public health to be included. With the current budget cuts, local health department staff can’t be everywhere they are needed. When it comes to public health issues, most emergency managers are completely unsure about where to start. Southwest Utah Public Health, through their emergency preparedness division, has helped both city and county emergency managers better understand how public health fits into our overall preparedness efforts. Rob Dotson, Emergency Manager for Enoch City, Utah worries about how the absence of his public health colleagues will affect safety in his community. “Without these people and the programs they oversee, our preparations would be incomplete and loss of life might be worse,” said Rob. Cuts to federal emergency preparedness programs mean that communities are less prepared for emergencies and people are more vulnerable. What will happen when dedicated public health professionals like Paulette give their all in an emergency and it is not enough?